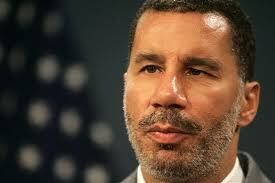 David Paterson is a New York politician. He is the son of Basil Paterson. Paterson served as the 55th Governor of New York, from 2008 to 2010. Since leaving office, Paterson has been a radio talk show host on station WOR in New York City. After graduating from Hofstra Law School, Paterson worked in the District Attorney's office of Queens County, New York, and on the staff of Manhattan Borough President David Dinkins. In 1985, he was elected to the New York State Senate to a seat that was once held by his father, former New York Secretary of State Basil Paterson. In 2003, he rose to the position of Senate Minority Leader. Paterson was selected as running mate by then-New York Attorney General and Democratic Party gubernatorial nominee Elliott Spitzer in the 2006 New York gubernatorial election. Spitzer and Paterson were elected in November 2006 with 69 percent of the vote, and Paterson took office as Lieutenant Governor on January 1, 2007. In February 1995, a private party was held in New York to celebrate Margery Tabankin who had been recently chosen to head Steven Spielberg's Righteous Person's Foundation, (Tabankin also ran the Streisand Foundation). Attendees included Jesse Jackson, Alan Bergman and Marilyn Bergman, Streisand publicist Ken Sunshine, Rev. Al Sharpton, Ruth Messinger, Charles Schumer, Mark Green, Basil Paterson, David Paterson, David Dinkins, New York Urban League President Dennis Walcott, and Warner Records chairman Danny Goldberg. The talk focused on how "liberals could take the political spotlight back from the conservatives"
David Paterson is a past recipient of Asian Americans for Equality's annual Dream of Equality award. This page was last modified on 18 January 2015, at 00:37.